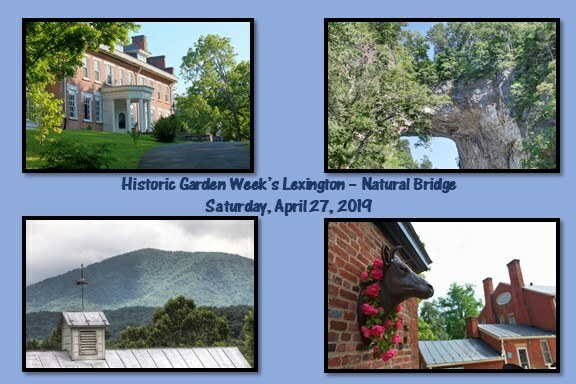 On Saturday April 27th from 10:00 am to 4:00 pm, the Blue Ridge Garden Club Lexington-Natural Bridge Tour will be held as part of the 2019 Virginia Historic Garden Week. The four properties on the "Homes and History" tour are Natural Bridge State Park; Herring Hall (circa 1812), built in the Federal style is a bed and breakfast; Vineyard Hill (circa 1774), which was recently purchased, is being restored by its new owners; and The Inn at Forest Oaks (circa 1806), a recently renovated English Country style home, which is also a bed and breakfast. Tickets can be purchased before the tour day via the link below. Beginning March 1st, tickets can be purchased at the Lexington & Rockbridge Visitors' Center, Books & Co., and Ladles and Linens for $25 using a cash or check. On the day of the tour, tickets will be sold at the Natural Bridge Visitors' Center, the Lexington & Rockbridge Visitors' Center, the three Lexington store locations, and the three homes on the tour for $30. Funds raised by the tour go towards the restoration of historic gardens and landmarks in the state. Visit "Historic Garden Week in Lexington" on Facebook for updates and further information.